This year’s primary election is on Tuesday, May 21, 2019. Here’s what you need to know. Update 3/25/19: In a Facebook post on Thursday, March 21, Chris Rosselot wrote that a “technicality will prevent [him] from being on the ballot in the May Democratic primary.” As of Friday, March 22, according to the Allegheny County Elections Office, Rosselot has received two challenges to his petition files in the Court of Common Pleas, but still remains on the ballot. To register to vote, verify your polling place and change your party affiliation by Monday, April 22, 2019. The primary election is on Tuesday, May 21, 2019. The general election is on Tuesday, Nov. 5, 2019. To register to vote, go to www.vote.org and do it online. You can also verify your registration and your polling place and change your party affiliation. If you do not have access to a computer, you can get a voter registration form at the Board of Elections, located downtown at 542 Forbes Ave #601. Many public libraries have voter registration forms, and if that is inconvenient, give me a call at 412-818-7326 and I will deliver a voter registration form to your house. I will even bring you a stamp to mail it. If you are temporarily out of town but still want to cast your vote, request an absentee voter ballot at https://www.vote.org/absentee-ballot/. You can also call the Board of Elections at 412-350-4500 and request one via mail. This is ideal for students who are attending college out of state or people serving in the military. Pennsylvania has closed primaries. This means that if you are not registered with a major party, you will not be able to vote in the primary election. Folks who aren’t registered with a major party may want to change party temporarily, so they can have some input in who wins. You can change your party affiliation to either Republican or Democrat to vote in the primary, and then change it back by Monday, Oct. 7, 2019 to vote in the general election. By the time you read this, we’ll be more than two months away from the primary, which is plenty of time to research the candidates and get an idea of where they stand. There will also be events around town for you to meet the candidates in person. Both incumbents (those currently in office) and their challengers are required to file petitions to get on the ballot. This must be completed by Tuesday, March 12. Don’t be surprised if candidates or people helping with their campaign show up at your door, asking you to sign their petition. This is normal, it is required, and it is a great way to exercise your civic duty. Tuesday, Feb. 19 – Petition season starts. Candidates get their required signatures to be added to the ballot. Allegheny County Elections can be reached at 412-350-4500.
voter registration information at www.vote.org. 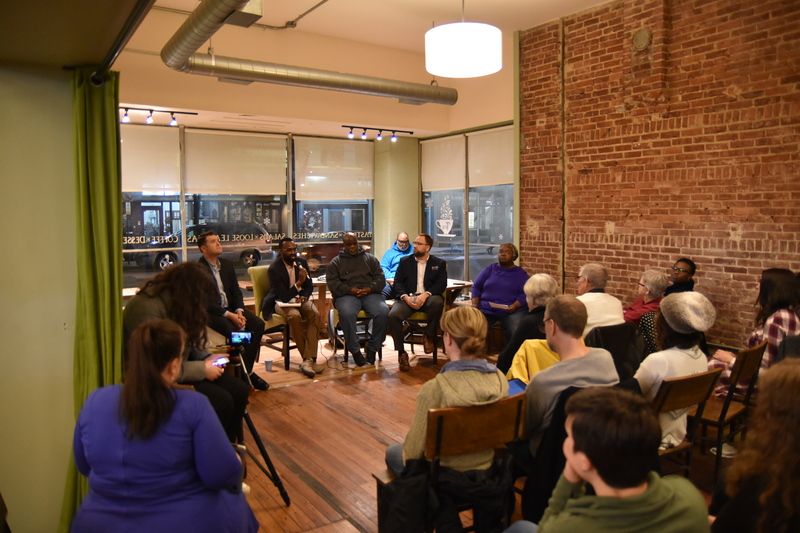 City Council District 1 hopefuls Chris Rosselot, Quincy Kofi Swanson, Mark Brentley and Bobby Wilson gather at Arnold’s Tea in Historic Deutschtown for the first candidate forum of the season. The forum was held on Monday, Feb. 25. *A previous version of this article called these “open seats,” which is technically incorrect.